Pictured left to right, Director Enoch Lewis, Phil Simmons, President Ricky Skerritt and Vice-President Kishore Shallow. ST JOHN’s, Antigua – Cricket West Indies (CWI) and Mr. Phil Simmons are pleased to announce that both parties have come to an amicable resolution in the claim from Simmons’ dismissal as head coach in 2016. 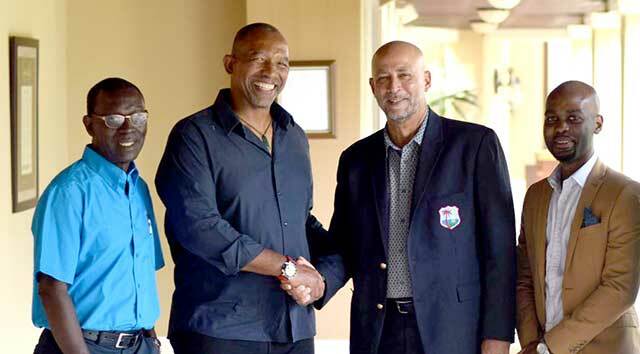 This is the first action by President Ricky Skerritt and Vice President Dr. Kishore Shallow to fulfill their campaign promise from the 10 point “Cricket First” plan, to repair stakeholder relationships, particularly with former players. After the court hearing formalities in the Antigua Industrial Court on Tuesday, it was agreed that the settlement amount will remain confidential. Cricket West Indies wishes Mr. Simmons continued success in his current Afghanistan Cricket role and all future endeavors.